The Montessori Method is a philosophy of teaching children that was developed in Italy in the early 1900s by Dr. Maria Montessori, a wonderfully bright and perceptive woman physician. 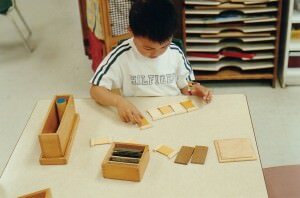 Montessori developed special “toys” which we call the Montessori Material, that allow the child to teach himself what he is ready and eager to learn, by guiding him using his own curiosity. The Montessori philosophy is based on the understanding that children are just naturally curious and given the opportunity to “figure things out” they will learn. Equally important, the philosophy recognizes that each child is unique and will learn according to his own developmental rhythm. The material provides the means for the child to develop and learn at his own pace. What is remarkable about the Montessori Method, is not only how well the children develop both academically and socially using this philosophy, but also the pleasure that the children derive from their experience within a Montessori environment. The Montessori Method of teaching is used successfully in thousands of schools around the world. 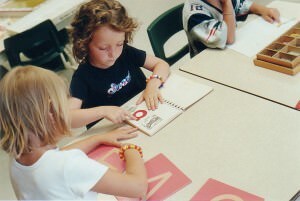 At the Montessori School of Pointe Claire we use the philosophy and material developed by Maria Montessori to provide a positive and fulfilling learning experience for young children that will meet their developmental needs at the appropriate time in their lives, and prepare them to enjoy schooling in the future and to succeed at school after they have graduated from our program. 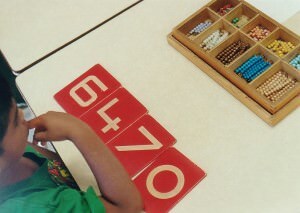 Our program is designed to provide a smooth transition from Montessori into the regular school system. For the child what he feels is that he is coming to play with his friends at Montessori. He is comfortable in the environment knowing that he is being cared for by loving adults. The child does not feel that his learning is work at all, rather that it is interesting and fun activities to do with his friends. At our daycare we have the full range of Montessori material designed for young children. In addition we also have a wide range of toys that complement the Montessori material and add to the enjoyment of the child. We believe that all learning is play, and all play is learning. Click to view the curriculum for prekindergarten, preschool and early socialization. During the time at Montessori, the child will be learning social skills, moral values, will develop language skills both in French and English, will be stimulated intellectually and start learning the basics of reading (phonetics) and arithmetic (mathematical concepts). He will also develop his motor skills particularly through use of the Montessori material for fine motor development and with our physical education program for gross motor skill development. Parents are encouraged to learn about the Montessori philosophy. The teachers will host an evening at the start of our academic year to explain the material and their classroom routine. The continuity of activities from school to home is encouraged. During the year the children will use the following material (depending on the child’s age). The teacher demonstrates the material to the child, and invites him to try it. The teacher is available for instruction and guidance where needed. The child learns at his/her own pace. The children are encouraged to use all the various material in the classroom: however, ultimately the child must choose what it is he/she will do, according to his/her interest at the time. This is the best, and the most enjoyable, way to learn.